Summary: The war in the Ukraine is, like many wars during the past few centuries, fought for the moral high ground as much as the physical terrain. Like many conflicts since WW2, it’s fought largely in the shadows by covert agencies of the participants and the great powers. Governments fall by mysterious means, dramatic actions make headlines, statesman make bold statements. But nothing is what it seems. The vignette of the anti-semitic flyer demonstrates these things in miniature, reminding us that journalists paint only the surface of events. We need analysis to see what lies beneath. A leaflet distributed in Donetsk, Ukraine calling for all Jews over 16 years old to register as Jews marred the Jewish community’s Passover festivities Monday (Passover eve), replacing them with feelings of concern. The leaflet demanded the city’s Jews supply a detailed list of all the property they own, or else have their citizenship revoked, face deportion and see their assets confiscated. Donetsk, a Ukraine province with 4.3 million people – 10% of Ukraine’s population – and 17,000 Jews, is home to much of the country’s heavy industry, and is thus the biggest prize of the eastern regions where pro-Russian separatists have captured government buildings in the past week. 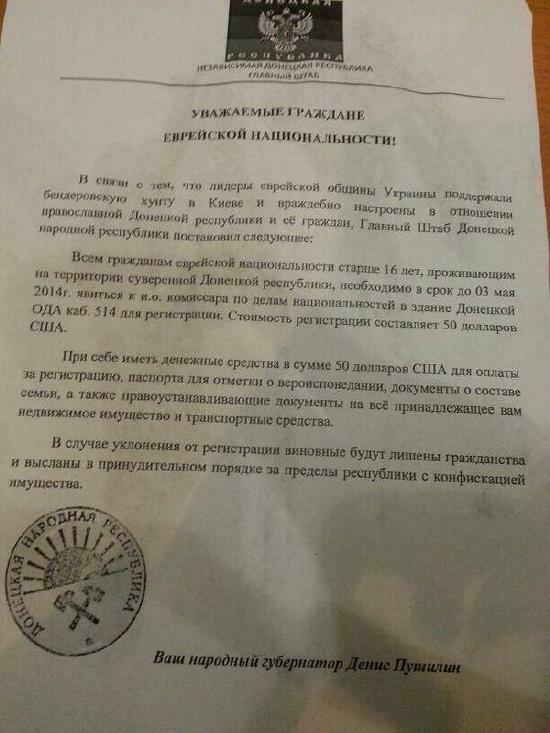 The leaflet, signed by Chairman of Donetsk’s temporary government Denis Pushilin, was distrbiuted to Jews near the Donetsk synagogue and later in other areas of the city where pro-Russians activists have declared Donetsk as an independent “people’s republic”, defying an ultimatum from Kiev to surrender. Although too absurd to believe, the usual suspects ran with the story. Propaganda moves the American mind, sign of a weak people. Just in the last couple of days, notices were sent to Jews in one city indicating that they had to identify themselves as Jews. And obviously, the accompanying threat implied is – or threatened – or suffer the consequences, one way or the other. In the year 2014, after all of the miles traveled and all of the journey of history, this is not just intolerable; it’s grotesque. It is beyond unacceptable. And any of the people who engage in these kinds of activities, from whatever party or whatever ideology or whatever place they crawl out of, there is no place for that. And unanimously, every party today joined in this condemnation of that kind of behavior. We’ve been in touch with a number of people both in the Jewish community leadership here in Kiev but also at the grassroots level in Donetsk. And everything that we’re hearing suggests that this is the real deal. And that it, apparently, is coming from somebody on the ground there among these radical groups, you know, either to stir fear or to create provocation justifying further violence. I would say also, I spoke today to somebody who is connected with groups on the ground in Mariupol and got a little bit of the same. The sort of atmosphere of fear is one of the major narratives right now and that’s something that, obviously, we are going to be watching closely over the next couple of days. The news of pro-Russian thugs trying to impose a tax on Jews first appeared on Wednesday morning on a small, local news website in eastern Ukraine called Novosti Donbassa. Along with a photo of a neo-Nazi throwing the Hitler salute, the website offered the story of three masked goons hanging around a synagogue in the city of Donetsk and handing out anti-Semitic fliers to local Jews. The site even ran a photo of the flier, which demanded that Jewish residents of Donetsk show up to “register,” pay a fee of “50 American dollars,” and offer proof of any property they own in the region. It all looked like a crude joke. … An Israeli official also told Fox News that the issue was brought to the attention of the Israeli embassy and foreign ministry, though they also presume the leaflets were handed out by local militia members as a kind of provocation. The official said the notices were distributed by masked men. DAVID GREGORY: Final question. There have been ghastly reports coming out of eastern Ukraine this week about some kind of forces forcing Jews in the eastern part of the country to register with local authorities. What do you make of this? Are these accurate? Are Jews particularly at risk? ARSENIY YATSENYUK: We got information that these so-called peaceful protesters with light ammunition in their hands, that they sent a number of bulletins saying that everyone who is a Jew to be indicated as a Jew. And today in the morning, I made a clear statement urged Ukrainian military and security forces and Ukrainian Department of Homeland Security urgently to find these bastards and to bring them to justice. Next Post A guide to the weird numbers that run our world, describing financial bubbles & climate change. Clumsy propaganda too (debunked in a couple of days). Looks like Brennan’s visit and advice is not paying off with any real results. And as for propaganda, those in the insular ‘western world elites’ don’t realise that …no one in the rest of the World believes them any longer .. on anything. RT, as an example, has thousands of times more credibility than anything the (eg) NYT has now. The western media ‘jumped the shark’ a long time ago. And, in fact even the US population doesn’t believe anything the Govt (and its media mouthpieces) says about Russia and the Ukraine (judging by the polls). But Putin’s performance has been amazing. If there was an election for a World President he’d win hands down. That ‘town hall meetting’ (done every year). 4 hours of questions… is there any western politician that could do that? Nope. Everyone of them tries as hard as they can to distance themselves from their own people. And all those leaks (like Nuland) brilliant. Posted on Youtube. Now that’s great work. Though I suspect that how it was done was by using agents with access to all the NSA intercepts who gave it to them (after all cheaper to buy one of the million who have access to it than build your own network). A hint to that was Putin’s very careful answer (and in some ways quite revealing) to Snowdown;s question. I think he told the truth in that Russia doesn’t have a ‘dragnet’ bugging operation and that it does have quite strict legal checks and balances. But I do believe that they have cracked people within (or with access to) the NSA bugging and have access to lots, if not everything, that it collects (note China probably does the same and Israel definitely does the same). Classic tradecraft your enemy does your work (and pays the money) for it. They were required to pay a $50 registration fee? Dollars? In Ukraine? Who wrote this statement – Americans? Of course. The US was worried about Israel not supporting it’s (daft neocon) actions in the Ukraine, so to try to get it onside (after the Jews in the Ukraine were terrified about the US supported nazi parties got to the top), so it did, probably Brennan recommended it. Reblogged this on William Tarbush's Compositions.